Ruthiebear (Titusville, NJ, United States) on 23 October 2016 in Animal & Insect. Avec sa crête blanche quel vue et siesté superbe repos. A beautiful image of this bird among the fallen leaves. Excellent color and detail. He seeks the warmth of the autumn sun. Great capture. Oh, il est tout mignon, tout beau!!! Bise, bon dimanche tout doux! She looks relaxed and stands out beautifully against the fallen leaves, very nice!! Wow ! This is a fabulous image !! Wonder if there are eggs down there !!! The white bird makes very good contrast with the background. It works for me. The bird looks very relaxed! Wonderful shot! A beautiful shot of the lady in white. ... magnificent animal sunbathing! Precious light! HUGS Ruthie! A nice photo of the lovely bird. Wonderful bird. 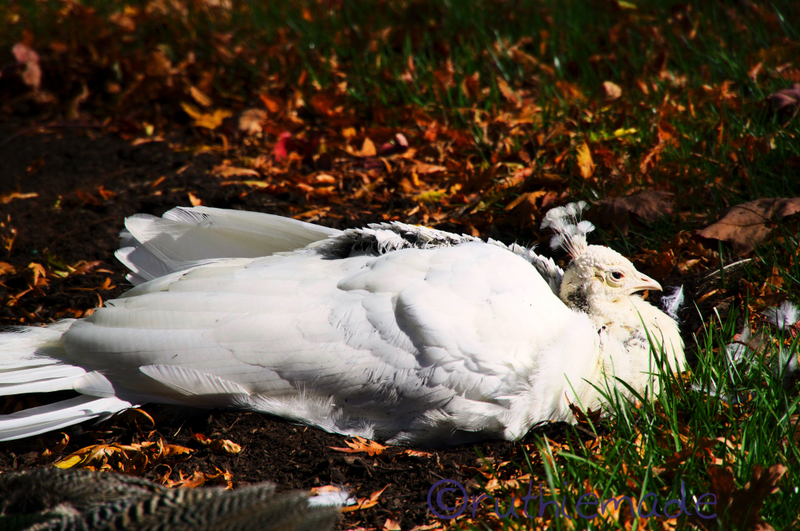 Don't think I have ever seen a white peahen. She is wearing her fancy hat. Cool.